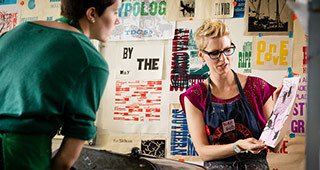 Learn more about the Studio Art and Art History majors and minors. Our faculty excel in helping students explore tools, materials, concepts, processes, theories and methodologies of the visual arts. Why choose Art History or Studio Art? Studying art history or studio art gives you the flexibility to pursue any minor or fulfill requirements for secondary teacher certification. Many students also choose to double major in Art History and Studio Art. And with ample opportunities to engage in art historical or archaeological research and writing, or produce advanced studio artwork, you will graduate prepared to further your education at graduate school, and pursue a career in museum work, art publishing, artist residencies, sustained professional studio practice, or other similar professional activities. Most importantly, a bachelor's degree in art prepares you to think creatively in any career or life pursuit you choose. Majors in Studio Art or Art History prepare students for careers in a variety of fields. Our majors have pursued graduate study in numerous disciplines, including studio art, art history, theology, social work, physics, medicine, business, and law. Graduates of our department currently work as artists and art consultants, in museums, as entrepreneurs, teachers, and attorneys, and in social justice, publishing, and fashion. For more information on career opportunities, please see the links on our After Graduation page. In our increasingly globalized and image-saturated world, the skills students learn in Art History have never been more important. Art History teaches us how various art forms express a given culture’s values, enriching our understanding of diverse traditions and enabling us to connect the present with the past. Art History majors learn to become critical viewers of visual material and articulate, informed communicators. One of the broadest fields in the Humanities, Art History incorporates the study of many disciplines, including history, politics, economics, psychology, philosophy, science, and cultural studies. Our professors are enthusiastic teachers and active scholars who are dedicated to working closely with students in and out of the classroom. 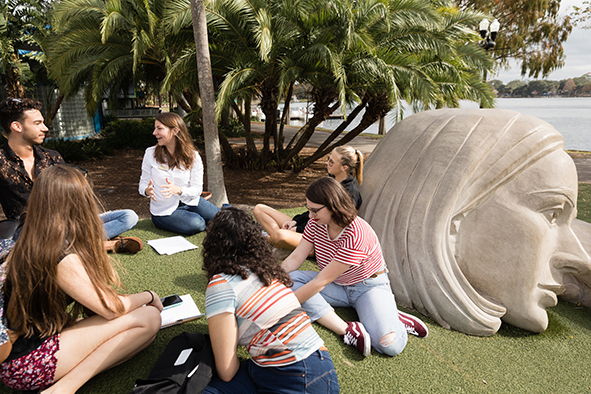 Whether in our small classes, collaborating on research with faculty, engaging with art at Rollins’ Cornell Fine Arts Museum, studying abroad, or gaining professional experience in internships, our majors benefit from a diverse and stimulating academic experience that can lead to a wide variety of career paths. In studio courses, students explore the tools and materials of the creative process while learning experientially about conceptual issues and creative strategies in visual arts. Young artists are challenged to develop their critical skills and to articulate their ideas and creative strategies through class discussions and critiques. Studio majors can choose to fulfill their requirements by taking elective courses in photography, sculpture, printmaking, book arts, graphic design, painting, drawing, and mixed media. Many courses also offer opportunities for professional development through community engagement projects. In addition, the year-long capstone experience leads studio majors through an intensive creative process in which they build a body of work to submit for the senior exhibition. Students who wish to declare the studio major or minor should contact their adviser or the Chair of the Department of Art and Art History (if the student does not have an adviser in the Department of Art and Art History) to discuss course sequencing and degree planning.